In the first article of this series I showed you a very unique and cool sounding fingerpicking solo technique for your guitar playing that involved open strings and the pentatonic scale. In the second article I showed you how to apply this technique to create awesome acoustic fingerpicking blues riffs with a twist. Now, in the 3rd and final article of this acoustic guitar soloing series, I am going to show you how to generate fast fingerpicking guitar solos using the very same technique that has featured throughout this series, that being the open strings of your guitar and the pentatonic scale patterns. This technique lends itself very well to playing fast fingerpicking solos on your guitar due to the consistency of what your picking hand is doing throughout. This was outlined in detail in the first article. If you have not read that article and completed the exercises that came with it, I highly recommend you do so first before going any further. This is essential if you are to understand what I am about to show you. I will assume you are familiar with, and have read the first 2 articles in this series as I now present to you the 3rd and final article lesson. As I mentioned already, the ability to play fast fingerpicking guitar solos using this technique is enhanced by the fact that your picking hand is playing a consistent pattern for the most part, that being the forward and backward banjo roll patterns. We are going to make it even easier to play fast fingerpicking solos by having our fretting hand become more consistent in what it does too, through sequences. There are different types of sequences in music. Today we will be using melodic sequences, which is when you play a repeating pattern of notes, within the different pitch ranges of a scale. You will see what I mean in a moment if sequences are new to you. You may like to warm up by applying the fingerpicking guitar open string technique that was introduced to you in the first article of this series, to the pattern above. 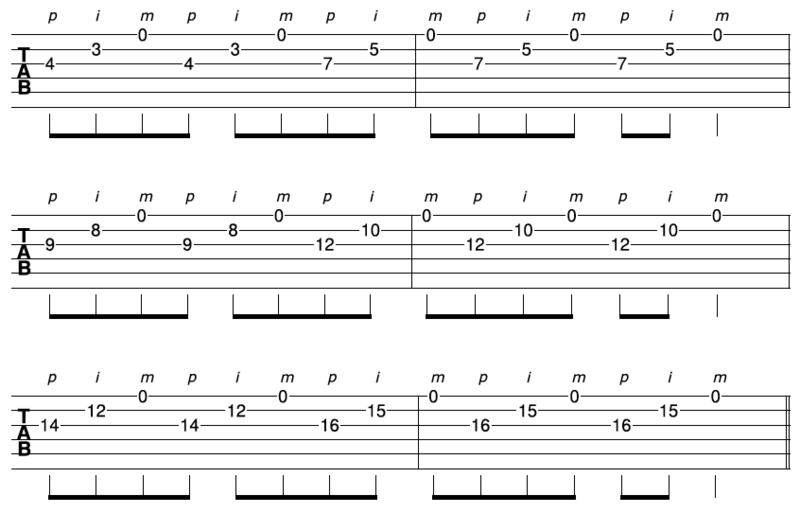 This first fingerpicking riff is a sequence that descends the pentatonic scale. Having said that, you could also ascend it too, to get more mileage from the riff. This is the nature of a melodic sequence. It’s just a repeating pattern, using different notes in the scale. The consistency of what your fretting hand is now doing, combined with the consistent pattern your picking hand is doing, makes it much easier to generate fast fingerpicking guitar solos. Another way you could take this same sequence, and apply it musically to generate fast solo riffs on your guitar, is to move it horizontally up the fretboard on any 2 adjacent string sets. As I move up the fretboard, I’m making sure I stay in key by only using notes from the G major pentatonic scale. Here is one of many great reasons why you want to know all 5 pentatonic scale shapes on your guitar and how they relate to each other. 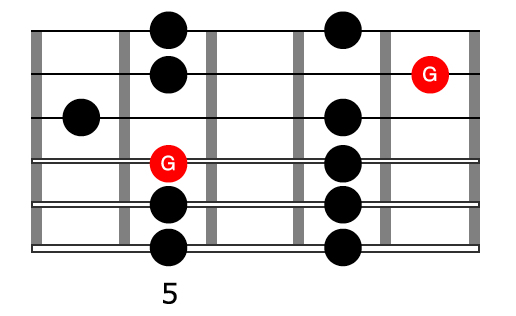 This next fingerpicking guitar riff is a 6 note sequence that ascends the scale. Banjo rolls in themselves can create great fast fingerpicking riffs for your guitar playing. The example above is a banjo roll in a single position. This can sound great with a chord progression underneath it. Each time the chord changes in the progression, the sound of your banjo roll changes, as the notes will relate differently to different chords. Another option is to take the banjo roll and run it up and down the fretboard. You could apply this idea with the banjo roll to other strings sets too, to get even more mileage out of it. Check out these open string fingerpicking riffs for playing fast on your guitar.